Asmus Tietchens (Germany, 1947) is a fully self-taught sound artist who started his first experiments with tape machines, soundgenerators and concrete sounds in the mid 60’s. In the 70’s he met producer Okko Bekker and got involved in some recordings of Cluster and Liliental. His first solo album ‘Nachtstücke’, produced by Peter Baumann (Tangerine Dream) got released in 1980. After 4 electro-pop albums on Sky Records Tietchens gets back to irregular patterns of sonic abstractions suspended in gray drones to create cold textural voids. Following this aesthetic he produced countless albums for labels as United Dairies, DOM, Esplendor Geometrico, A-Mission through which he got seriously acknowledged in the world of post-industrial avantgarde music. In the mid 80’s he starts working with the Fairlight CMI and does various lectures/concerts in South America. Since 2000 he reanimates his electro-pop vibe as Hematic Sunsets (another Asmus Tietchens anagram). His music is often inspired by and refers to the texts of the philosopher E.M Cioran. Tietchens also teaches sound design, communication design and sound research at the Hochschule für angewandte Wissenschaften Hamburg and won some awards from the German Radio (SWR). 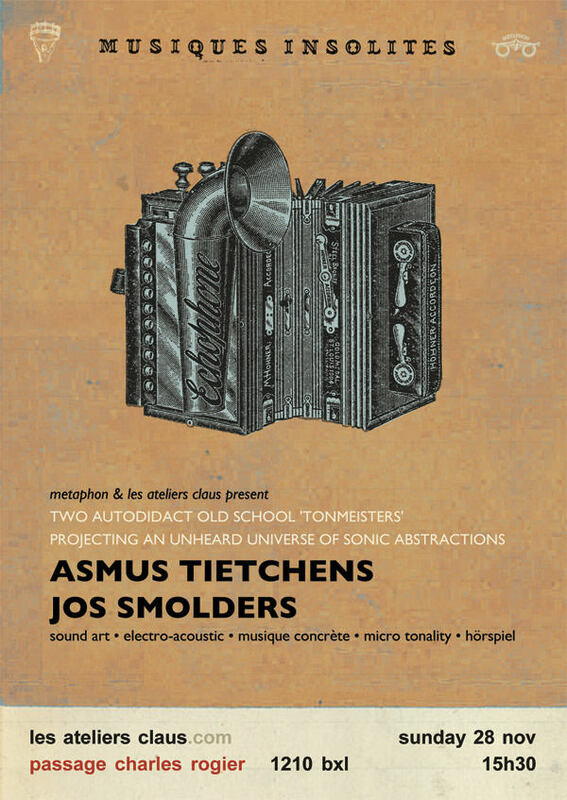 Jos Smolders (The Netherlands,1960) studied architecture at the Delft Technical University but quit and continued the musical tape experiments of his childhood. He started musicological studies of electronic and recorded music, was six years co-editor of Vital Magazine. Being active in the underground electronic music scene since the mid 80’s and as founding member of the renowned Dutch electroacoustic ensemble THU20 his works got released on cassette,LP and CD on labels as Korm Plastics, Quiet Artworks, Staalplaat and on his own MP3 label/online magazine Earlabs. Smolders currently works as a sound designer and composer in Tilburg (The Netherlands).